I love the fruits of summer and always try to eat as many as possible during their short season. I had grown bored of my usual breakfast of Greek yogurt, berries and granola so this recipe really caught my eye in this months BBC Good Food magazine. The original recipe suggested banana and raspberry to accompany the pancakes but my loathing of bananas and love of nectarines spurred me to swap the fruits to whatever I had in the fridge this weekend. a selection of soft fruits (I used nectarine, strawberries and blueberries. Tip the flour into a large jug or batter bowl with the cinnamon. Add the egg and milk, and whisk vigorously until you have a smooth pouring consistency. Place a non-stick frying pan over a medium heat and spray with a little of the oil. Once the pan is hot, pour a small amount of the batter into the centre of the pan and swirl it to the sides of the pan in a thin layer. Leave to cook, untouched, for about 2 mins. When it is brown underneath, turn over and cook for 1 min more. Transfer to a warm plate and cover with foil to keep warm. Repeat with the remaining batter. 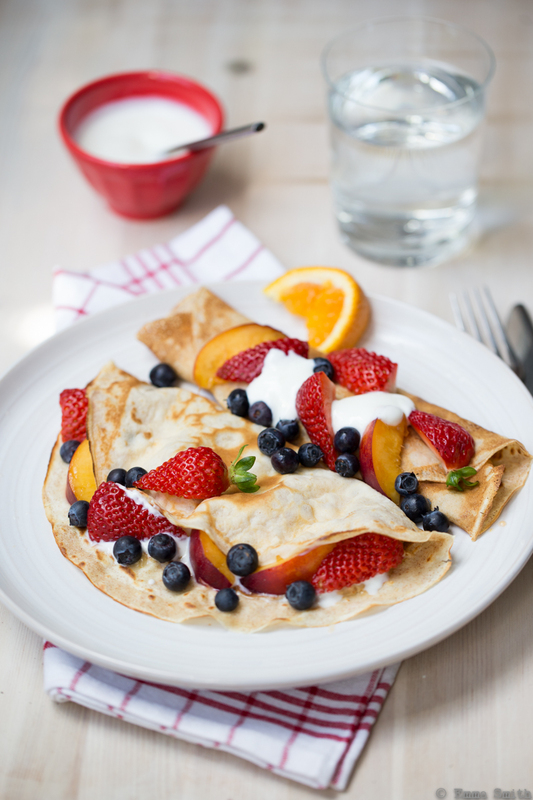 Divide the warm pancakes between 2 plates and serve with the nut butter, Greek yogurt, berries and lemon/orange juice.